Intermediate players looking for easy targeting and arm-friendly comfort should like this update to Head's Radical S. This version comes with Graphene Touch, which adds a dampening material called Kraibon to Head's polarized weight system. The overal result is exceptional vibration dampening and easy power. The Ultra 100L is a great tool for the intermediate player looking for an easy swinging racquet that feels explosive on full swings. It should also work for the strong beginner who wants a frame that will reward continued improvement. Nova is designed for the player looking to add explosive power to their game. This player enhancement frame allows you to hit massive shots from anywhere on the court. With it's spin friendly 16x19 string pattern, you'll find easy access to spin and power on groundstrokes and a huge boost of pop on the serve. The Four BLX is a great beginner or intermediate racquet. With its light weight and large head size, this racquet offers power and maneuverability without sacrificing control of your shots. 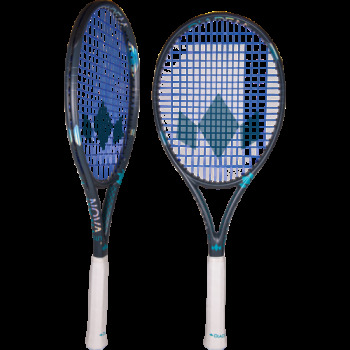 This racquet excels when faced with medium paced rallies, and performs well when put to the test at the net. Introducing the lightest and fastest member of the Ultra franchise. At only 272 strung, this racket is extremely easy to use, making it great for beginners. It should also work for the intermediate player who requires maximum maneuverability or the rising junior who is ready for an adult performance frame. The Yonex Ezone 98α tennis racquet is a mid weight racquet packed with features for the intermediate player. With the EZONE Feel Yonex delivers an impressive combination of speed, spin and controllable power to improving players. In addition to being a great frame for beginners, the EZONE Feel should work well for the intermediate who wants a lighter option. Thanks to an updated Isometric head shape, the EZONE Feel has a slightly larger sweetspot than the previous generation. For 2018, Wilson adds another chapter to the Pro Staff 97L. This racquet has the same white and black cosmetic as the racquet Federer uses on tour, complete with the same velvety paint and chrome touches. For this update, Wilson drops the Countervail technology, resulting in a firmer and more powerful response. At just under 11 ounces, the 97L swings fast, making it easier for less advanced players to load the ball with pace and spin. Dunlop Force Tour 100 26 "
This 26" junior racquet has many of the same high-end technologies that the adult-sized Dunlop Force racquet has, making it perfect for the competitive junior. Aeroskin CX and Aero Boost grommets help the racquet cut through the air like a hot knife through butter, allowing your aggressive junior player to swing fast for loads of power and spin. Power meets maneuverability. The PWR Speed combines great maneuverability with unmatched power to resemble Tour performance of the Speed racquets. Babolat gives the legendary AeroPro Drive a big makeover. This version is called the Pure Aero and it boasts a more aerodynamic beam and higher swingweight. The result is a racquet that trades a little bit of maneuverability for some ball crushing momentum and a welcomed boost in stability. The Nova Lite 100 is designed for the player looking to add explosive power to their game, in a lighter more maneuverable set up. Ideal for young juniors or recreational players looking for a lighter frame with added power. This player enhancement frame allows you to hit massive shots from anywhere on the court. With it’s spin friendly 16×19 string pattern, you’ll find easy access to spin and power on groundstrokes and a huge boost of pop on the serve. Nova Lite’s stunning design and metallic accents will have you exploding the ball past your opponent in style. Like its predecessor, this version of the Pure Drive Lite is perfect for the player who wants the power, precision and spin of the standard Pure Drive but in a lighter more manageable package. Lighter and easier to handle than the grown-up INSTINCT series, the INSTINCT JR. still gives you the perfect combination of power and superior handling while still providing a softer feel and less vibrations for ultimate comfort.Its dynamic 16/19 string pattern for some extra spin and the innovative Graphene Touch technology for incredible touch and solid feel.